Europe's Gamescom video game show is now underway in Cologne, Germany, and despite the absence of the major players in our ongoing console wars, the event has already brought plenty of news, announcements, and trailers for the games we'll be playing in the near future. Let's take a look at a few of the biggest reveals so far. The fifth and final episode of Latoya Peterson's "Girl Gamers" series discusses the history of games, as well as a series of game recommendations from many of the women who've appeared in the series. And it's all thanks to something called the Phantom Limb Project. Video game company Konami has chosen to partner with the Alternative Limb Project to form the Phantom Limb Project. The goal is to develop and build a prosthetic limb for gamer and fan James Young. Look at that mask. Those moving pieces. Lights! Sure, we now have an "explanation" for why Quiet wears a bikini (aside from the obvious male gaze reasons, that is), but is there also some additional logic for why the male characters don't spend as much time as she does sensually frolicking? Born with a silver brick in his mouth. Janine Atkinson and her husband were on their way to Wexham Park Hospital after Janine's contractions started, when the two realized that they weren't going to make it to the hospital in time and would need to find a place to pull over. Remember back in 2013, when Metal Gear Solid fans first reacted to the costume design for the character Quiet? Hideo Kojima assured us all that Metal Gear Solid V would include a narrative explanation for Quiet's bikini, and that once we found out what it was, everybody would "feel ashamed of your words & deeds." If you want to know Quiet's secret back-story, read on. If this is true, it's kind of a troll. If it's not true, it's even more of a troll. Kojima's playing with us all. Welp. It's officially official. 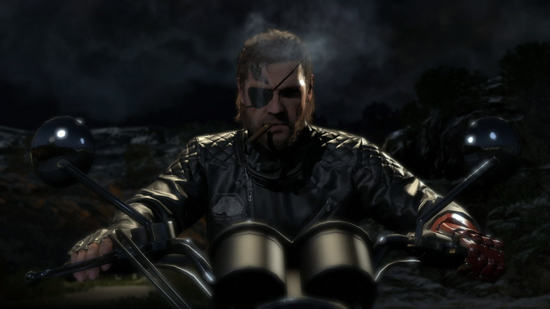 David Hayter, long-time voice actor of Snake and Big Boss in the Metal Gear Solid franchise is out, and Kiefer Sutherland of 24 and The Lost Boys fame is in. This confirms the suspicions that have been floating around ever since the initial trailer for Metal Gear Solid V: The Phantom Pain surfaced. This is the world we live in now. If you're reading this, there's a good chance that we don't even have to explain exactly how strange the Metal Gear Solid franchise has been in the past. The latest and greatest, officially called Metal Gear Solid V: The Phantom Pain, is no exception. The marketing efforts for this installment, which have included originally announcing what appears to be the actual game under a fake studio led by a man with his face covered in bandages, have been particularly strange. Regardless, we now know a bit more about the game thanks to last night's GDC reveal. There's something to be said about building an entire video game around a horrible pun. 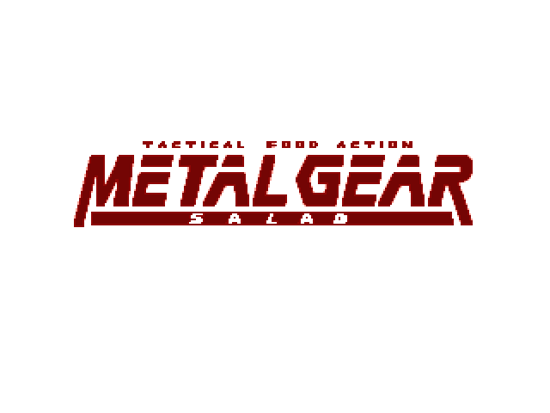 John Earnest has done exactly that with Metal Gear Salad, a matching game spoof of Metal Gear Solid that's in the same vein as Bejeweled. See, the Colonel's hungry for a snack and, due to his diet, only a salad will satisfy. Snake will just have to procure all the ingredients in the right amount, matching up at least four of them together, in order to gain points. Metal Gear Solid godfather Hideo Kojima started talking a lot about his next Metal Gear game, Metal Gear Solid: Ground Zeroes, this weekend. After announcing the game at the celebration for the 25th anniversary of the Metal Gear franchise in Tokyo, Kojima flew to Seattle for a panel at PAX Prime, where he dished out details about how Ground Zeroes fits into the Metal Gear Solid mythos. 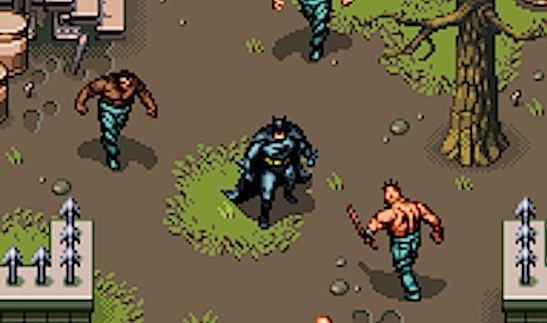 For years, fans of Metal Gear Solid have been comparing the video game's iterations to film. Since Metal Gear Solid 2, however, they've certainly had some points. Now, after many years of boasting, they won't have to compare the games to movies; it will simply be one in addition to being a game. 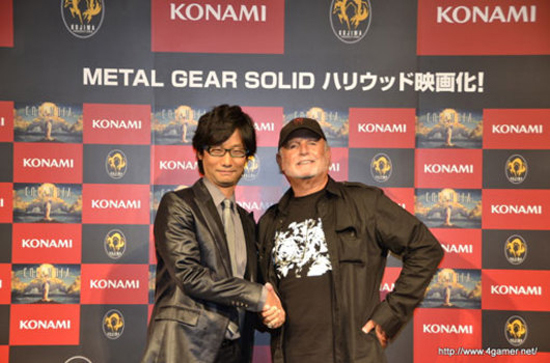 The film was announced at a Metal Gear 25th anniversary event in Japan. Details are sparse, but feel free to get ridiculously excited. We all know the Metal Gear Solid isn't done, even though Metal Gear Solid 4 tried really, really hard to end the series (and would've been a satisfactory send-off at that), and Konami likes to remind us about the continuing saga from time to time. 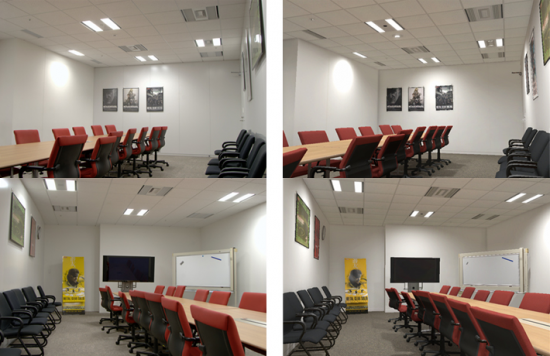 This time, though, Konami showed off the Fox Engine, which is the engine being used to develop that next MGS. Instead of simply showing off the incredible visuals of which the engine is capable, they placed said visuals next to shots from real life and challenged us to pick which was computer generated. Left column or right column? RISK has changed. Instead of little plastic army men and cannons fighting over South America, players can now be little plastic private military corporation soliders led by Solid Snake, Liquid Ocelot, everyone's favorite replacement Raiden, and other notable figures from the Metal Gear Solid universe. The game includes over 290 custom game pieces, 5 PMC armies, 8 Bosses, an Outer Haven battleship, Drebin' Shop cards, territory cards, PMC headquarters, a custom Outer Haven game board, and 7 dice. 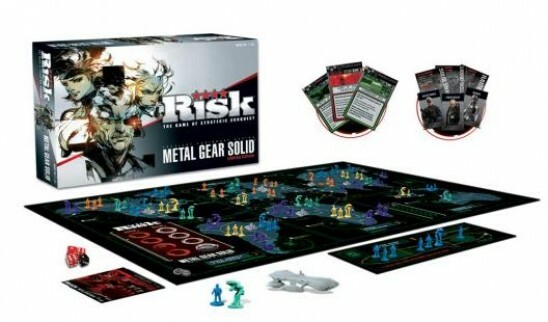 Only 2,014 copies of the limited edition Metal Gear Solid RISK will be made, so fans should probably pre-order a copy, with pre-orders opening on October 3 and last until November 15, or until supplies run out. 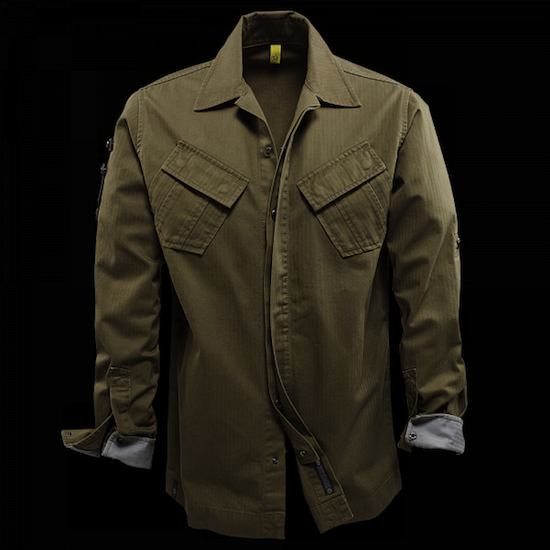 Hideo Kojima may be responsible for hour-long cutscenes and some of the only gameplay to this date that rewards the player for being sneaky rather than murdery, but we fans of the series know Yoji Shinkawa is responsible for all things art when it comes to Kojima's most famous franchise, Metal Gear Solid. During an art exhibit at the Konami Style store in Tokyo, Shinkawa shows off his artsy chops and paints a portrait of Solid Snake in that famous MGS "blobby style," with nothing but two strips of tape, a small tub of paint, and some weird white marker thing. It wouldn't be the holidays without some espionage action, right? After all, Santa manages to infiltrate millions of chimneys, snack on cookies and milk, and leave a bunch of presents underneath a tree without being noticed by the modern-day security systems many people have installed in their homes, or being arrested for breaking and entering. 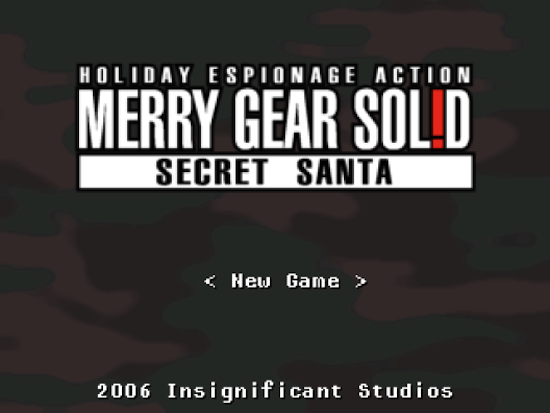 Luckily for us, Arthur Lee built two games in which heavy-footed, non-Santa folks like us could live out their dream of playing a Metal Gear Solid game about Santa Claus. This Irish stand-up comedian, Dara O'Briain, does a whole bit about Snake, the main character from the famed Metal Gear Solid series. The weird part is, it's actually pretty funny. It's only not safe for work because of a few curse words, so either turn down the volume or plug in some headphones. I'm surprised and proud that the audience is laughing at jokes as specific as these. "Not toggle maps!" This guy knows what's up.